Microxygenation and maceration are two very important stages of wine-making that determine the stability and quality of wine. Both of these processes are related to the polyphenol content of wine. The determination and characterisation of polyphenols is therefore a fundamental tool for the winemaker to better manage vinification and to guarantee the quality of the finished product. The CDR laboratories have developed a broader analysis panel, implemented on CDR WineLab®, which offers the oenologist a focussed and more precise control of both the polyphenolic extraction phase in red wines (maceration), and the subsequent phase of polyphenolic stabilisation (and therefore also of the colour stabilisation) that occurs with the micro-oxygenation process. Polyphenols determined by the Folin Ciocalteau method. The complete analysis panel for the determination of polyphenols, implemented on CDR WineLab®, greatly widens the possibilities of controlling maceration, allowing monitoring, actually within the winery and in only a few minutes, of the increase in concentration of tannins and anthocyanins during alcoholic fermentation. In this way it is possible to optimise the extraction process by acting on the number of pumpings and/or follature to be carried out to obtain an optimal extraction, suitable for the type of vine being processed. Micro-oxygenation is carried out by injecting oxygen through specific devices, simulating the natural oxygenation that takes place in barriques. This process, achievable through various devices on the market, promotes the link between anthocyanins and tannins and therefore the stabilisation of colour. Performing the analysis of Total Anthocyanins (SO2 method), of Tannins, of polymerised anthocyanins and HCl Index during microxygenation means being able to follow the evolution of colour stabilisation for the entire process, thus supporting sensory analysis with objective data. 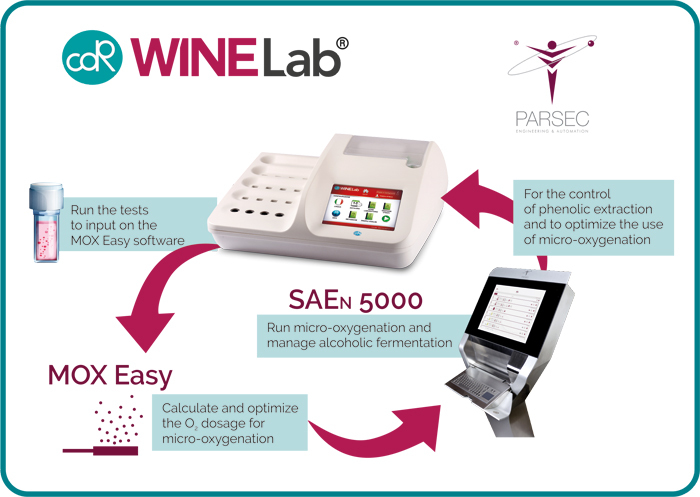 Micro-oxygenation management can be carried out optimally by connecting WineLab®® to the Parsec system, consisting of the MoxEeasy software and the system for automation and control of the SAEn 5000 winery. At the beginning of the process it is possible to determine the appropriate oxygen dose for the wine to be treated through the MoxEeasy software, developed by Parsec, exploiting the results of the analyses that are useful for characterisation of the polyphenols carried out with the CDR WineLab® system®. During the micro-oxygenation process, it is possible to monitor the trend of total anthocyanins, tannins, polymerised anthocyanins and HCl index using CDR WineLab® which sends through the Ethernet connection, the results of the analyses to the Parsec SAEn 5000 which manages the process of microoxygenation. With CDR WineLab®, the MoxEeasy software and the Parsec SAEn 5000 system, the winemaker has a powerful “integrated”” micro-oxygenation execution and control tool. CDR WineLab® is equipped with software that allows reading and storing of the bar code. The results of all the analyses available on the instrument can be associated with a specific sample and sent to the company management system. In this way it is possible to create, directly in the winery, analytical screening, on all the samples, with a complete overview of the evolution of the wine throughout the vinification phase. Maceration and micro-oxygenation in the winemaking process was last modified: April 9th, 2019 by CDR s.r.l.